Overall print size: 22" x 28". In "American Patrol" Major George E. Preddy, Jr. of the 487th FS, 352nd FG turns his attention towards a Bf-109G-6 from 1./JG 300 FG as it streaks through a formation of B-17 bombers from the 100th BG while Preddy flies his P-51D-5NA Mustang "Cripes A' Mighty 3rd". This action took place on 29 July 1944 during 8th AF mission #503 to the Halle-Leuna Synthetic Oil Refineries near Merseberg, Germany. 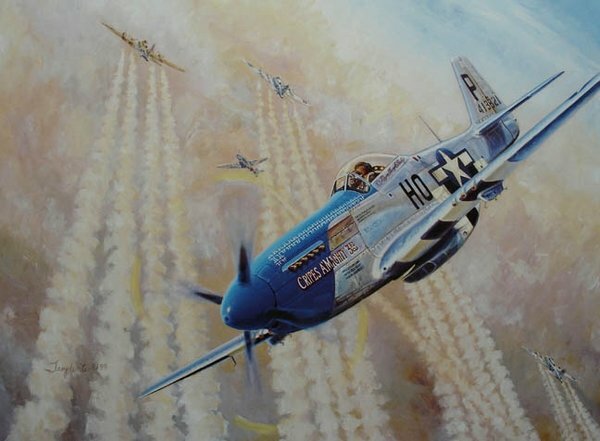 Preddy, who would go on to be the world’s top scoring P-51 Mustang Ace, was credited with the destruction of one Me109 on this date. The 352nd FG, based at Bodney, England, claimed a total of eight Me109s and 1 Fw-190 during this Merseberg mission.